The Urban Forms Foundation has been activity bringing street art to the city of Lodz, Poland since 2009. They have recently just wrapped up their street art festival called “Lodz 4 Cultures”, with ‘Alphabet of Dialogue’ being the theme of 2017. It is also the year of the Avant-garde in Poland and invited artists, Opiemme, Tellas, Nespoon, Moneyless, Hyuro, Robert Rumas, Kasia Breska and Nomad Clan were searching for their own original expressions, not only in forms, but also in artistic creeds. Italian artist Opiemme created two murals at the Primary School nr 45, Bojowników Getta street 3, his dialogue was with the architecture. His murals “Remanufacture”/ “Herring” was a tribute to famous avant-garde artist Wladyslaw Strzemiński, who in 1930’s invented the strzemienica fonts. This original font is a repetitive decorative motif on the vertical stripes on the front façade. The stairs as well create a frame around the calligram on the back wall of the school. The calligram itself refers to the local motif – The Old Town Park, unofficially called Park Śledzia/Herring Park, due to its functioning as a fish market in the Jewish Area of the city before WW2. Opiemme also carried out workshops with the pupils. Fellow Italian artist, Tellas, created a unique composition on the building belonging to the Medical University, Czechosłowacka street 2a. The artist had been thinking about creating a monochromatic, black and white mural for a long time, and was influenced by the landscape in Lodz . Although one can see grass on the pictures, the charm of the mural will be even greater when the snow falls, hence the name of the work: “Deep Winter”. Also from Italy was Moneyless, his installations and paintings are focused on the relationship between the simplicity of geometric composition and the richness of its meanings. In Lodz he created a mural on a somewhat ruined building at the intersection of Wojska Polskiego and Zula Pacanowska streets. He composed his piece into a horizontal partition of the wall thus exposing its heterogeneous texture. The layers, colours, and textures of the work are the language of abstraction used to tell the life cycles of architecture and its inhabitants. Fellow Polish artist Robert Rumas was faced with the difficult task of reviving the 1950’s space of the Old Market Place in Lodz. Rumas based his design on four masts, on which he hung up big yellow tapes with quotes from the “Kwiaty polskie/Polish Flowers“, a poem written by Lodz poet Julian Tuwim. Apart from the form that itself catches our attention, social and political implications of his work are also very important. 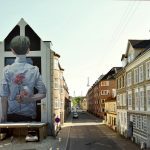 Valencia based artist Hyuro created a mural on a wall in Lodz. It reflects her unique style that combines surreal sensitivity with a social and political message. As she says, she is looking for inspiration both in daily observations and in her own inner experiences. Kasia Breska, a female artist based in Leeds, Uk, and was inspired to create a unique, colourful piece in an abandoned, destroyed building supported by wooden pieces, evoking the image of a graduation tower, hence the popular name of the place – Ciechocinek. The area is a yard connecting Jaracza Street with the infamous ‘Włókienka” ,a place of very bad reputation! Kasia piece “Totems of Lodz”corresponded with the structure of elevation, the rhythm of empty windows or wood logs. For the artist, every space was a special ecosystem, a habitat co-created by human beings, animals, architecture and time. Consisting of geometrical forms and straight graphical signs, “Totems of Lodz” enters into dialogue with its surroundings, as well as with the past and the present of the place. Also from UK were strong female duo Nomad Clan. They dedicated their mural Mokosh (created on the wall of the former factory) to all women as being part of the creation of industrial Lodz. The title Mokosh is a Slavic mother-goddess, patroness of women and their activities such as spinning and weaving. The opening of the mural was enriched by the energetic concert of the Folk’n Roll team and the performance of the LINEACT group, „Entwined” – showing the ordinary life of spinners of Lodz.